Diverse members of the U.S. Bishops’ Conference have already voiced opposition to some of President Trump’s actions, including on immigration, Cardinal Turkson told journalists Thursday morning. “This, for us, is a sign that little by little, other positions and political voices will emerge. We hope that Trump himself will rethink some of his decisions,” he said. 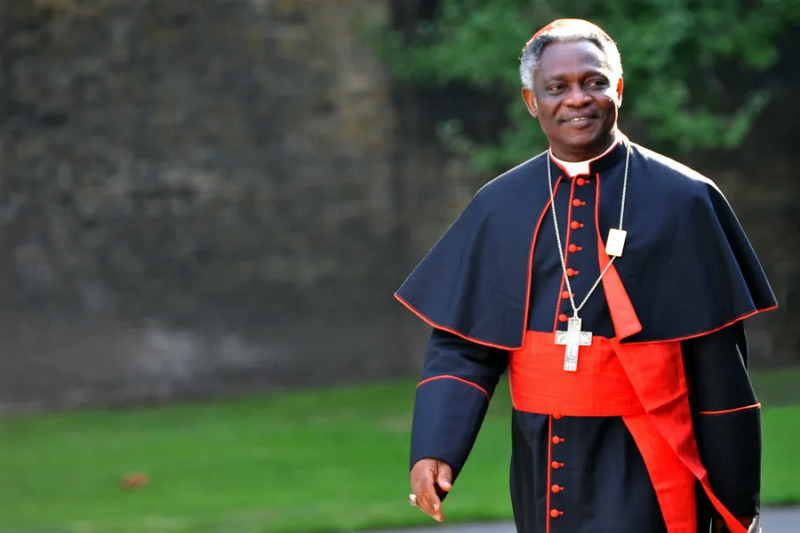 Head of the Dicastery for Integral Human Development, Turkson spoke to journalists at a breakfast meeting March 30 on a conference the department will hold at the Vatican April 3 and 4. But “we are hopeful that things will change,” he said, especially when Trump begins to see “the dissonance between the reality of things” and promises made during his election campaign. Otherwise, other world powers, like China, are ready to step in and fill the “space,” he said, noting that China is already making some efforts on climate control, especially given the large amount of smog and air pollution the country faces. Pope Francis has been very vocal on the importance of protecting the environment throughout his papacy, publishing the first papal encyclical dedicated to the topic, Laudato Si, in 2015. Shortly after its release he instituted the World Day of Prayer for the Care of Creation to take place every year on Sept. 1. The dicastery’s upcoming conference, being held in honor of the 50th anniversary of the publication of Pope Paul VI’s encyclical Populorum Progressio (On the Development of People), aims to discuss the question: “who is man?” the cardinal said. The two-day conference includes sessions with presentations on the themes of the body and soul, man and woman, the individual and society, as well as testimonies on serving vulnerable populations. The conference will also include time for dialogue and an audience with Pope Francis on April 4. In other comments to journalists, Cardinal Turkson said that “immigration is like water flowing from the tap,” you can’t just try to dry up the water, you have to turn off the faucet. This can only be done through long-term plans that promote projects in the countries migrants are fleeing and “prevent the need of people to emigrate,” he said. Vatican City, Aug 25, 2017 / 12:02 pm (CNA/EWTN News).- After his recent visit to Russia, Vatican Secretary of State Cardinal Pietro Parolin said a key message of his overall “positive” trip was the crucial role the country plays in working for peace, which he voiced to President Vladimir Putin. “I tried above all to say this, this was the message that I wanted to convey: that Russia, because of her geographic position, her history, her culture, her past and her present, has a great role to play in the international community, in the world,” Cardinal Parolin said Aug. 25. Cardinal Parolin spoke to Alessandro Gisotti from the Secretariat for Communications after returning from his Aug. 21-24 visit to Russia, during which he met with leaders of the Russian Orthodox Church and civil authorities. 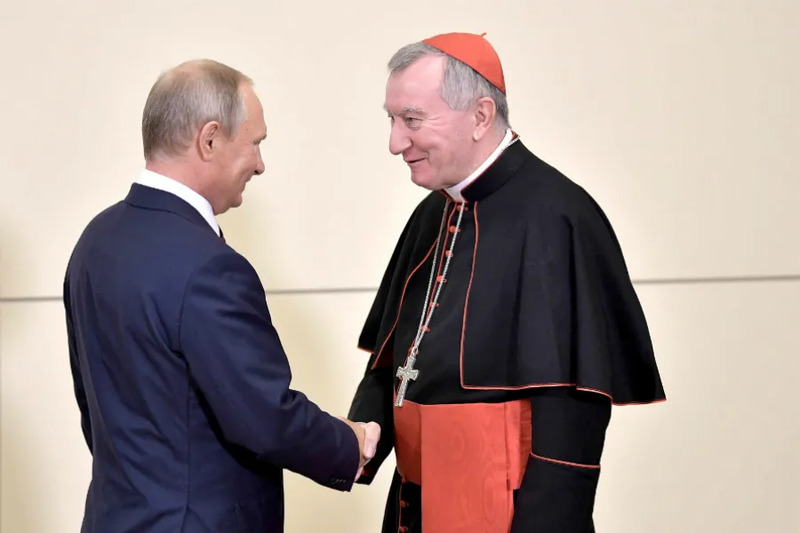 Having met with the Pope immediately after returning to Rome, Cardinal Parolin said Francis was happy to hear about the “positive result” of the visit to Russia. The meetings “were characterized by a climate of cordiality, a climate of listening, a climate of respect. I would define them as meaningful encounters, they were also constructive encounters,” he said. In addition to sharing how he was moved by the faith and religiosity of the Russian people, both Catholic and Orthodox, Cardinal Parolin said many different issues were addressed, including Ukraine and Syria. Suggestions for future areas of collaboration between not only the Holy See and Russia, but also the Catholic Church and the Russian Orthodox Church, were also discussed, such as the release of prisoners in Ukraine, the restitution of Church property confiscated during the communist regime, and collaboration in providing humanitarian aid to Ukraine and the Middle East. Q: Eminence, there was understandably great expectation for your visit to Russia. What sentiments do you have coming back to the Vatican? I think the balance of this trip is a very positive balance and so my sentiments are, of course, sentiments of gratitude to the Lord for having accompanied me during these days. We were able to realize the program that was already fixed, to keep the scheduled encounters, and I have to say that these meetings – at the level of civil authority with President Putin and with the Minister of Foreign Affairs Lavrov, and then with the leaders of the hierarchy of the Russian Orthodox Church, Patriarch Kirill and Metropolitan Hilarion – were characterized by a climate of cordiality, a climate of listening, a climate of respect. I would define them as meaningful encounters, they were also constructive encounters. I feel that I have to put a bit of emphasis on this word: “constructive encounters.” Of course, then, there was also the part of the encounter with the Catholic community. Above all thanks to the conversation and dialogue we had with the bishops in the nunciature, it was possible to know from a bit closer the reality, the life, of the Catholic community in Russia, her joys, her hopes, but also her challenges and the difficulties she has to face. For the latter, in part, it was possible to represent them, to expose them to the authorities. I cite one for all: the theme of the restitution of some churches that were confiscated during the time of the communist regime and for which there still has not been any restitution in the face of the need of the Catholic community to have adequate places of worship. So, I would say that in the end – to use this word – it was a useful trip, it was an interesting trip, it was a constructive trip. 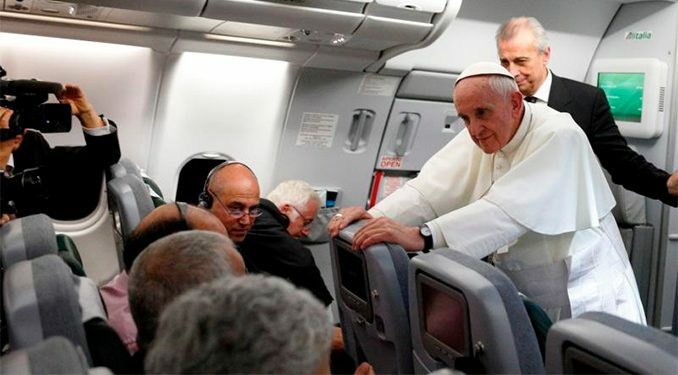 Q: Have you already had the chance to speak with the Holy Father about the trip? What can you share about what you said? Yes, naturally as soon as I returned I went to the Holy Father to give him a short, brief, concise account of both the contents and the results of the trip and naturally I conveyed the greetings that were given on the part of all parties I met, from the affection and closeness of the Catholic community, to the respectful greetings of the authorities. I remember that President Putin – I think it was also recorded in the public part of the meeting – underlined the living memory he keeps of his meetings with Pope Francis in 2013 and 2015. And then also the fraternal greeting of Patriarch Kirill. Of course the Pope was pleased with these impressions, of these positive results which I communicated; the Pope, as we know – he repeated also in this circumstance – is very, very attentive to all opportunities for dialogue that there can be, he is very attentive to value all the dialogues we have and he is very happy when making steps in this direction. Q: What were the principle themes discussed in the meeting with Patriarch Kirill? I would say that fundamentally we considered this new climate, this new atmosphere which reings in the relations between the Russian Orthodox Church and the Catholic Church; this new climate, this new atmosphere which has been established in recent years and which, naturally, has had a particularly significant moment and strong acceleration thanks to the meeting in Havana between the Patriarch and the Pope, which this event followed. Truly, I noted from the part of both Orthodox interlocutors how they were moved by the experience of the visit of the relics of St. Nicholas of Bari to Moscow and St. Petersburg, but in the sense that they were touched by the faith and religiosity of the people. It was highlighted that as many Russians who belong to the Orthodox tradition but don’t practice, drew close to the Church on this occasion. It was truly a great event both in terms of size – there were two and a half million faithful who visited the relics – and in terms of the impact of faith and spirituality that this event produced. We then went through some of the steps that have been taken and those that will be, which ought to be the steps taken in the future. To me it seems that on their part, as naturally also on our part, they do not want to exhaust the potential that this new phase has opened, and naturally the collaboration can take place in various areas, at various levels: from cultural collaboration – academic – to humanitarian…this point was heavily stressed, that in front of the situations of conflict that exist in the world, the two Churches can really carry out an incisive and effective humanitarian work. Also touched on – with respect and at the same time frankness – themes that are a bit prickly in relations between the two Churches; however, we tried to give – at least in my opinion, what I took away – a rather positive sense, that is, to explore shared ways to tackle and to try to solve these problems. And of course even these shared paths, these concrete proposals that emerged must be verified and possibly implemented after an adequate discernment and study. Q: Now, Eminence, regarding more sensitive themes: the question of Ukraine is one of the most delicate in relations between the Holy See and Russia. You visited Ukraine a year ago. Is there some news after your visit? New, until now, there is none…perhaps it’s premature to think about something new. The Lord – we hope – will make it sprout and bear fruit, if there were those seeds of good that we tried to plant. However, as noted, the question of Ukraine is one of the issues of greatest concern for the Holy See: the Pope has spoken many times about this topic…It’s obvious that this could not be treated, this theme; it could not be forgotten in that circumstance. I would say that above all in the sense of trying to see, to evaluate, whether there were any concrete steps that could be made toward a lasting and just solution to the conflict, which are virtually the agreements reached between the two parties. And it is well known that the Holy See has first of all insisted on the humanitarian aspects starting with the Pope’s great initiative in Ukraine (last year’s collection). In this sense, for example, one of the themes is that of the freeing of prisoners: this is one of the “humanitarian” topics that could really be important in giving some impetus to the entire process, even politically, to get out of this stasis and and to advance – for example – the topic of the truce, the ceasefire, the topic of security conditions in the area, the topic, also, of the political conditions in order to make progress in the global solution. 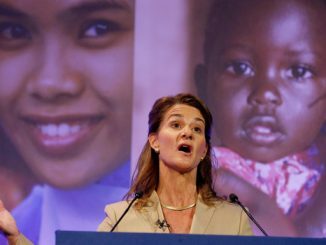 So we hope that something can help to walk in the right direction, taking into account – when we talk of solutions, of humanitarian issues – that we are speaking about people and speaking about suffering. And I think that this is what everyone must have in mind precisely to try to make an extra effort to go in the right direction. Q: The media naturally gave a lot of attention to the encounter in Sochi with Vladimir Putin. How did the meeting with the Russian president go? I would say that the meeting with President Putin enters a bit into the evaluation that I have at the beginning: it was a cordial meeting, it was a respectful meeting in which we were able to address the issues that at least we had in our hearts to discuss, such as, for example, the Middle East, the situation of Syria in particular, and in this context also the issue of the presence of Christians: we know that one of the coincidences that there are between Russia and the Holy See is precisely this attention to the situation of Christians, the theme of Christian persecution, which we tend to widen to all religious groups – naturally – and to all minorities, trying to involve even Muslims, as was done for example in that seminar that took place in Geneva last year. Then, on the topic of Ukraine, we have already spoken a bit; the theme of Venezuela: I saw that some media also reported some statements that were made in this sense. So, other than bilateral themes, which I mentioned at the beginning, we presented some situations of difficulty for the Catholic community. I tried above all to say this, this was the message that I wanted to convey: that Russia, because of her geographic position, her history, her culture, her past and her present, has a great role to play in the international community, in the world. A great role to play. And so it has a particular responsibility regarding peace: both the country and her leaders have a great responsibility regarding the building of peace and they must really strive to put the higher interests of peace above all other interests. Q: Finally, Eminence, other than the most significant encounters, is there another moment or specific aspect you want to highlight? Yes, there was the beautiful moment of Mass together with the Catholic community. The cathedral was crowded with people and it was a bit of a surprise, because it was a holiday, so that many people weren’t expected. Then, of course, the faith and devotion of this people always moves me: how the participate in Mass, with such attention, with such reverence, with such silence, they are present there. And I think that they came more than anything to express their attachment to the Pope and the fact of being members of the universal Church. So that was a nice moment. Another beautiful moment was the brief visit to the Sisters of Mother Teresa who work in Moscow. We were able to meet and greet the people they assist, even there it was shown a great affection toward the Pope. And then, the last thing that I want to recall: I was very impressed by the visit we made one evening to the Cathedral of Christ the Savior, the Orthodox cathedral of Moscow; the cathedral that was blown up during the communist regime. So it was also a moment to remember this painful history in the age in which they wanted to completely eradicate the faith from the hearts of believers and eliminate every dream of the presence of God and the Church in that land. Something they weren’t able to do, because God is greater than the projects of men.